WASHINGTON — Some of Donald Trump’s boasts from the first weeks of his presidency were dashed by developments in recent days. For example, builders of the Keystone XL pipeline were let off the hook from a buy-American requirement that Trump had promised. During the campaign and again after his election, as Obama-era unemployment dropped to and hovered at healthier levels, Trump claimed the real jobless rate was on the order of 40 percent or more. He got that number by counting people who could conceivably work, including millions who don’t want to because they are retirees, students or otherwise out of the workforce by choice. “The unemployment number, as you know, is totally fiction,” Trump said in December after his victory. 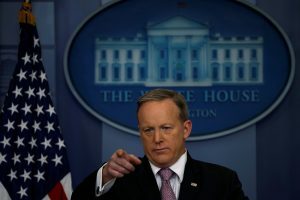 READ MORE: Fact Check: Spicer’s Pre-emptive Attack on the Nonpartisan C.B.O. Associated Press writers Seth Borenstein, Matthew Daly, Christopher S. Rugaber, Jesse J. Holland and Andrew Taylor in Washington, Ben Fox in Miami and David Bauder in New York contributed to this report. Left: White House Press Secretary Sean Spicer holds the daily press briefing Mar. 10 at the White House in Washington, D.C. Photo by REUTERS/Jonathan Ernst.